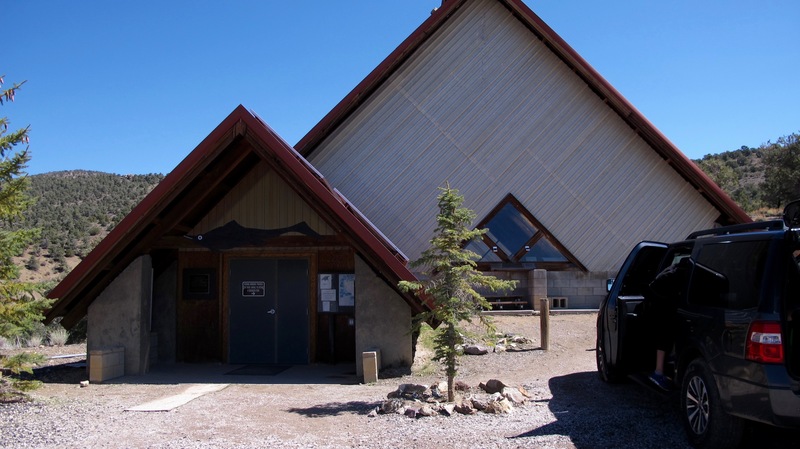 The elevation ranges from 6,840 feed to a high point of 7,880 feet. 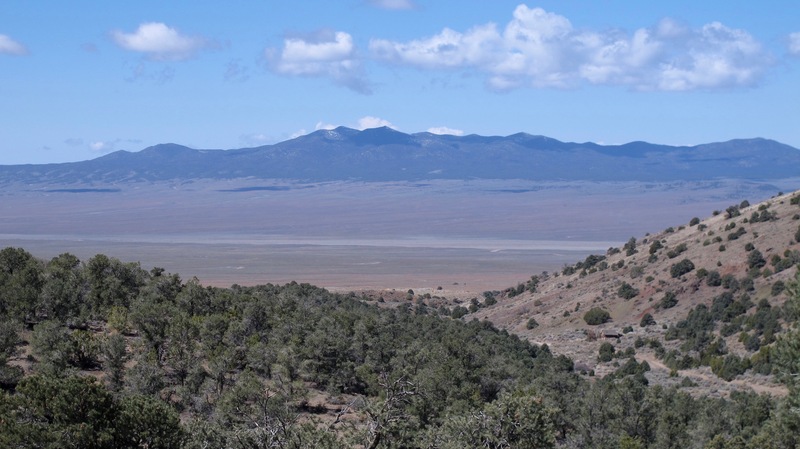 The hillsides in the park are covered with sagebrush (the state flower), while piñyon pine (state tree) and Utah juniper dominate the upper elevations. This is looking toward the Berlin town site. 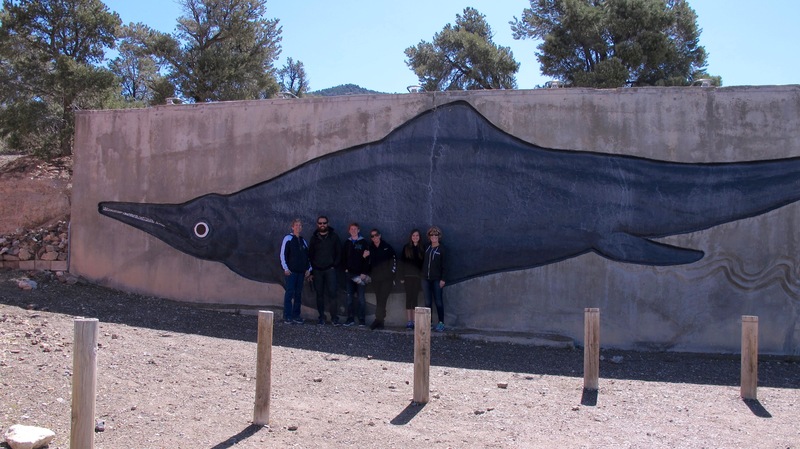 All of us were most excited to get to see the Ichthyosaur fossils at this park. 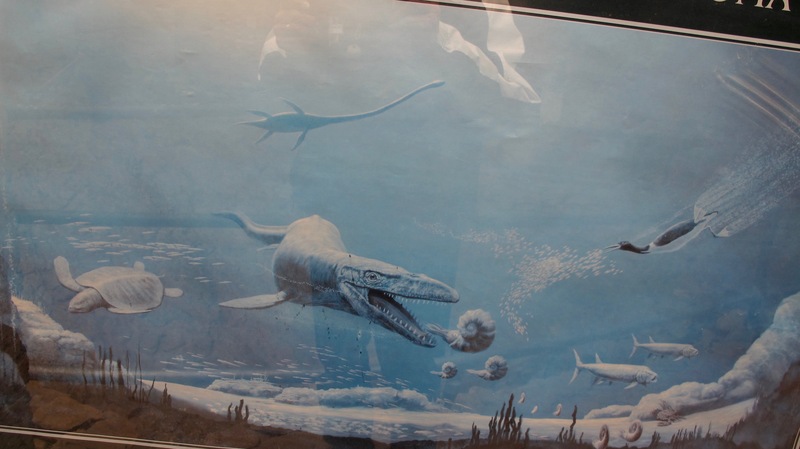 “Ickys” were prehistoric marine reptiles ranging in size from two to over fifty feet in length! The largest specimen (now the state fossil) dubbed Shonisaurus popularis after the Shoshone mountain range where they were discovered in 1928. 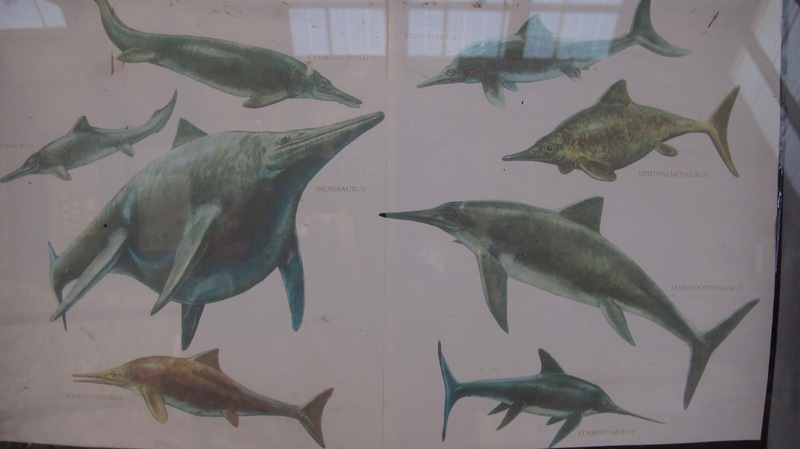 This is a life-sized painting on a wall near the fossil shelter. You can see how big they were compared to humans. Their eyeball was really that big in comparison to their bodies. 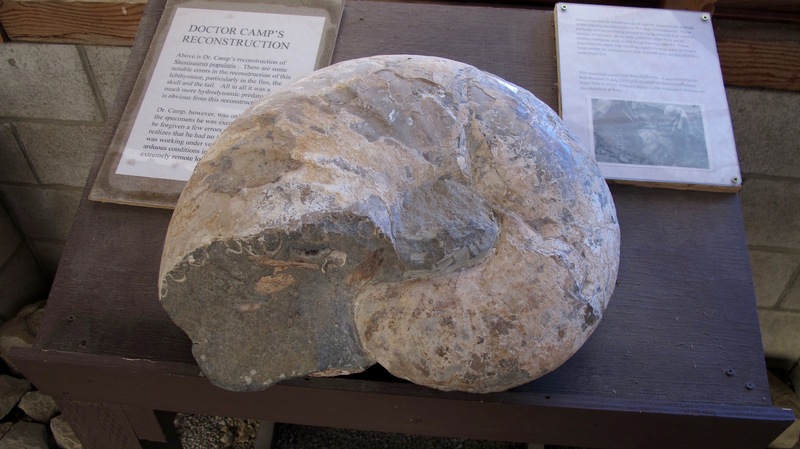 One of their favorite foods was an ammonite that would have been free swimming in the ocean. 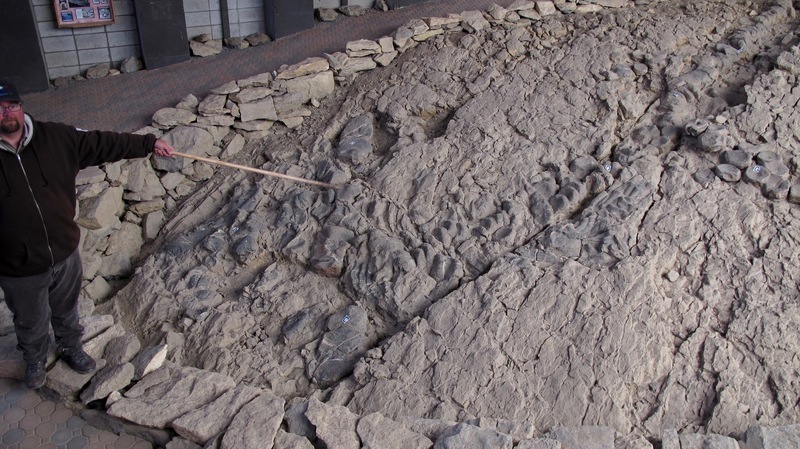 The Fossil Shelter, high up in the mountains, covers many ichthyosaur fossils still embedded in the ground where they were found. It is a fascinating exhibit! We were very fortunate to have talked to Ranger Jeff, who took time to give us a special tour of this facility. The regular tour season doesn’t begin until May 1. It pays to talk to people and let them know how interested you are in what they are saying. Jeff pointed out where the fossilized remains were and how they “stacked up” in relation to each other. What do I mean by “stacked up?” That’s what the fossils are. It is not known if the “ickys” beached themselves or just how they got in this position. 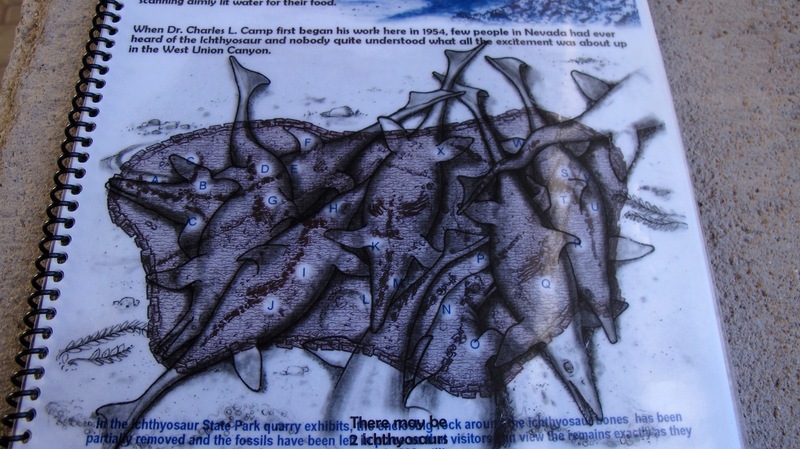 But here is an overlay in a pamphlet that shows how the bodies were on top of one another. Now, with the overlay taken off, you can see the outlines of the fossils. 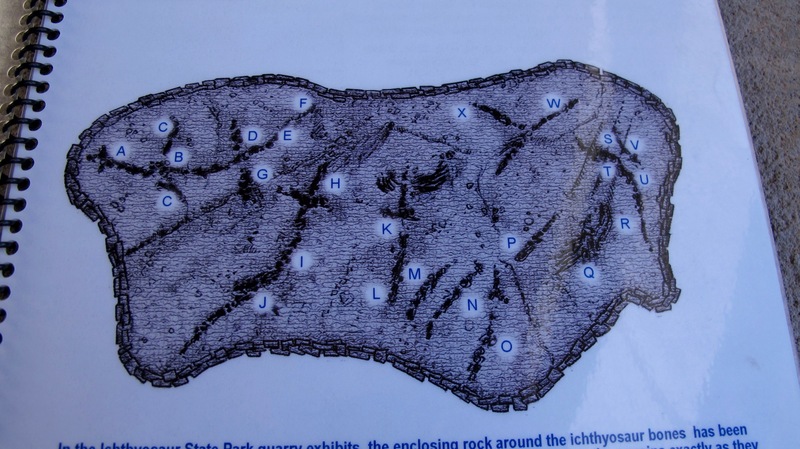 The letters are areas where Jeff pointed to and then we could see a skull, an eye socket, flipper bones, etc. I found this very interesting and a great technique to aid amateurs in figuring out what they were seeing. Jeff is pointing to some ichthyosaur ribs, vertebrae and flipper bones. 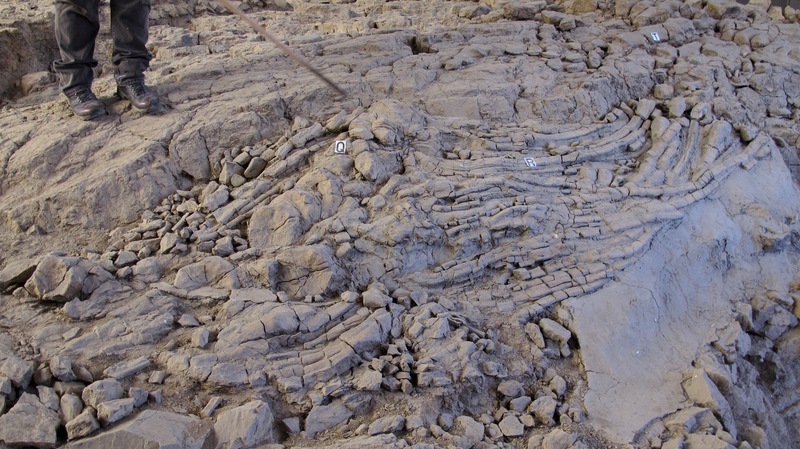 I would have thought they were just layers of mud. I really enjoyed being in this fossil shelter and felt privileged that we were the only ones in there that day. We drove back down the mountain with this view to Berlin to eat lunch and then walk around the Berlin site. It was a pretty day. 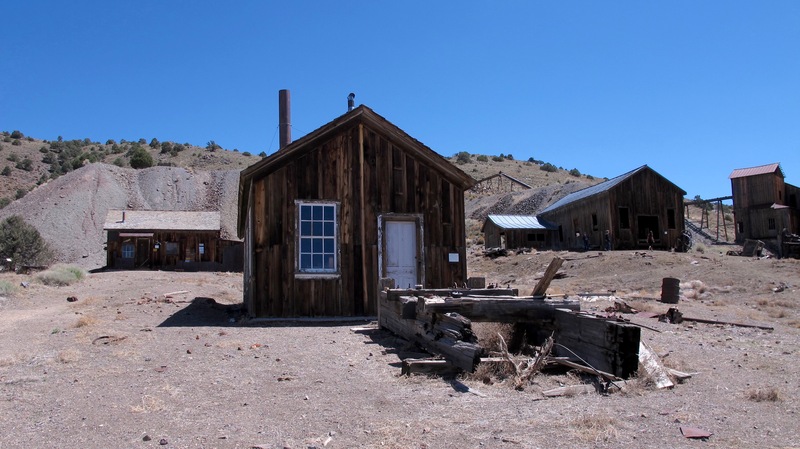 The Berlin State Park contains many historic buildings, which are maintained in a state of “arrested decay,” much like the Bodie State Park is in California. 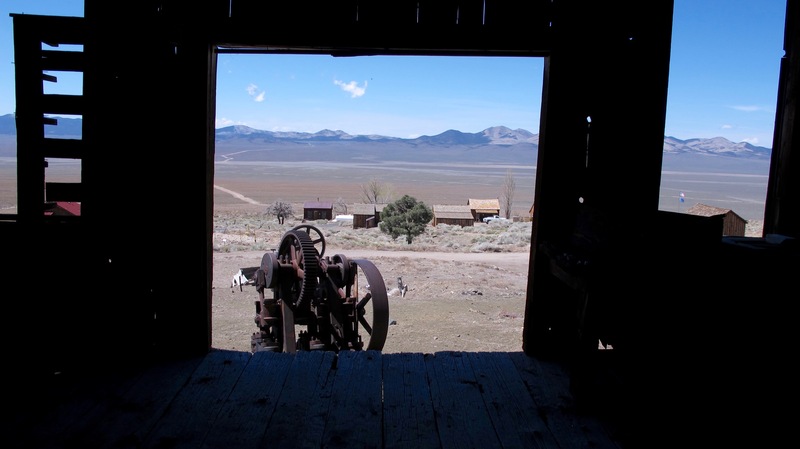 These buildings offer a visitor a glimpse of Nevada’s mining past, with varied period artifacts and effects on display. 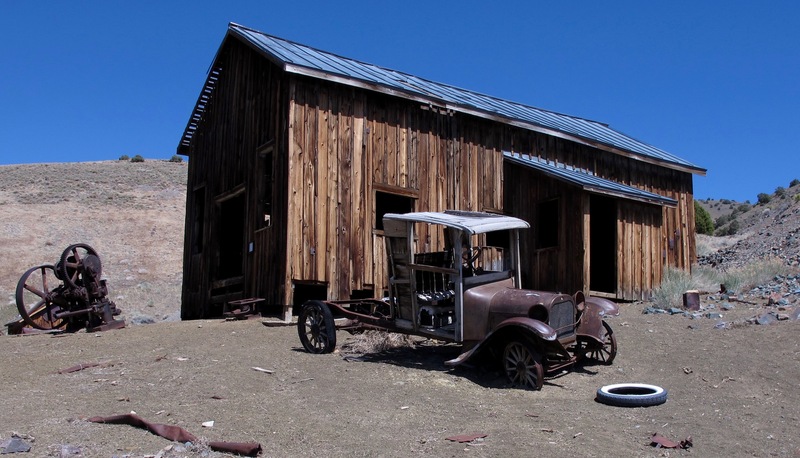 Old pickup in front of the machine shop. From inside the machine shop overlooking the town and valley. An overview picture of Berlin with the large mill on the left side. Berlin’s population never exceeded 250 and many of the people’s buildings no longer exist. We did walk around the very well marked area where cabins/houses had been and learned a lot from those signs. 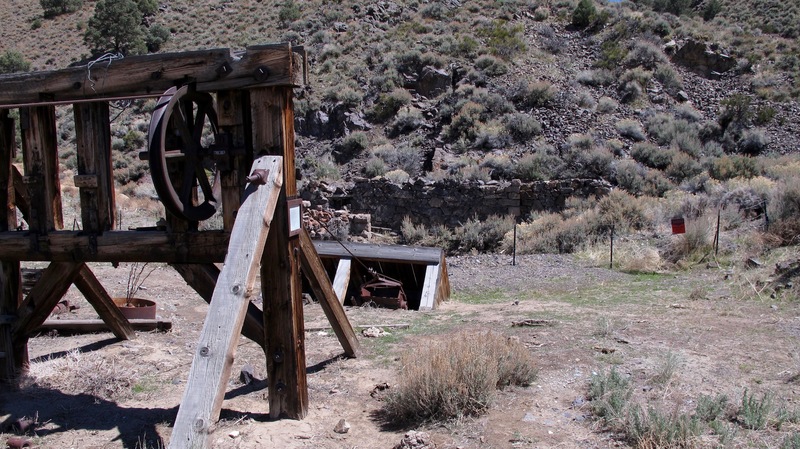 The Berlin Mine hoist that took out the ore that sits just above an abandoned incline mining shaft that struck eastward into the Shoshone Range. 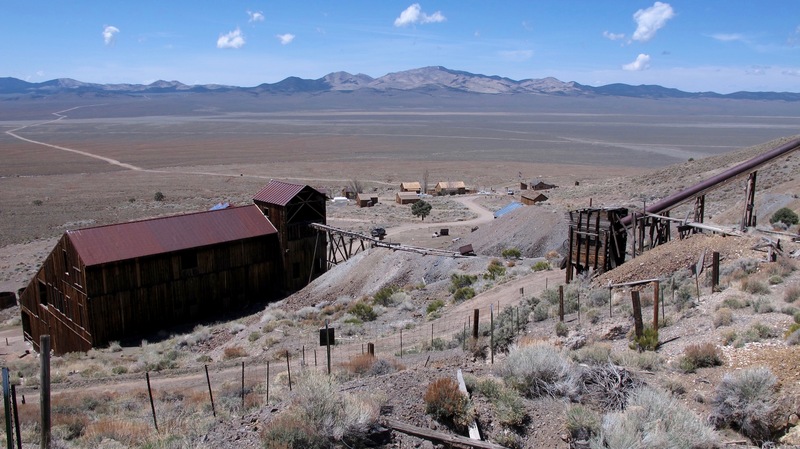 The Berlin Mine was in operation from 1897 to 1910. It was a 60/40 mine, 60% silver and 40% gold. 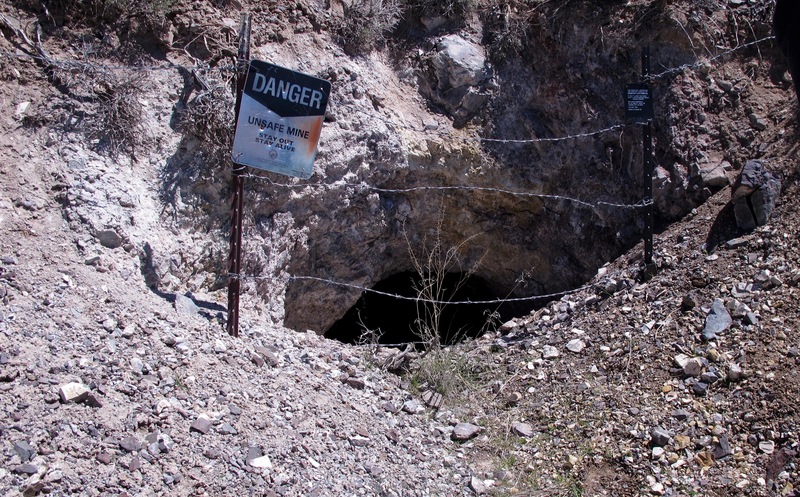 In the 13 years of operation, they extracted $849,000 in precious metals from the mine. We saw several abandoned mines while hiking around Berlin. 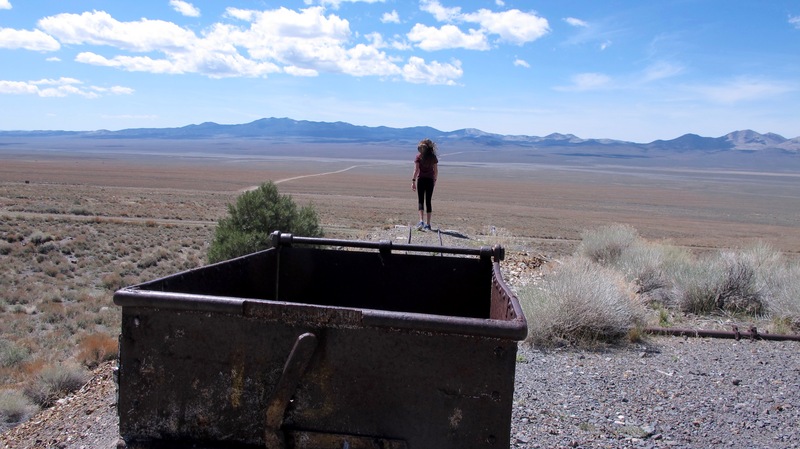 There are hundreds of those mines throughout Nevada that are very dangerous due to bad air, rotten timbers in the shafts or ladders, or poisonous varmints that could hide in them. 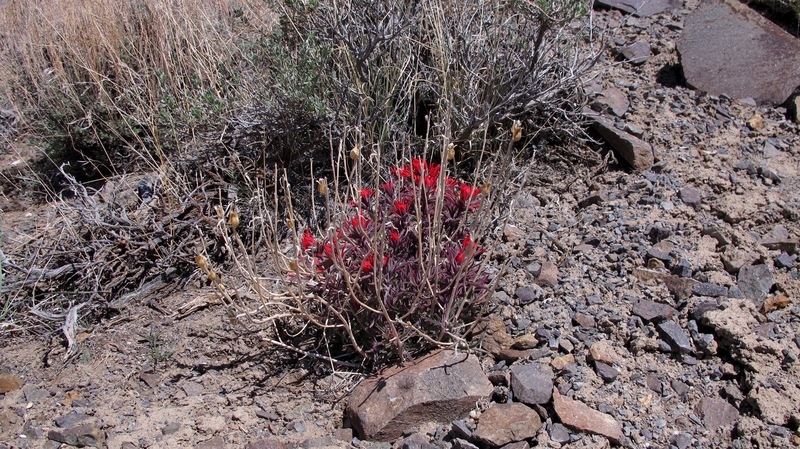 An Indian paintbrush is the only flower I saw in my trek around the town. 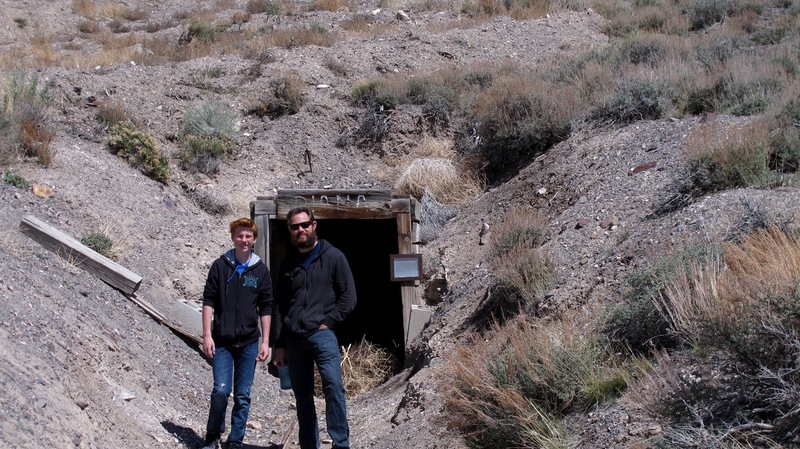 Dalan and Jason at the entrance to the Diana Mine. It was just a few hundred yards from the town of Berlin. Tours are given on weekends from May 1 to September 30. Dalan, Megan and Jason around a Diana Mine ore car. 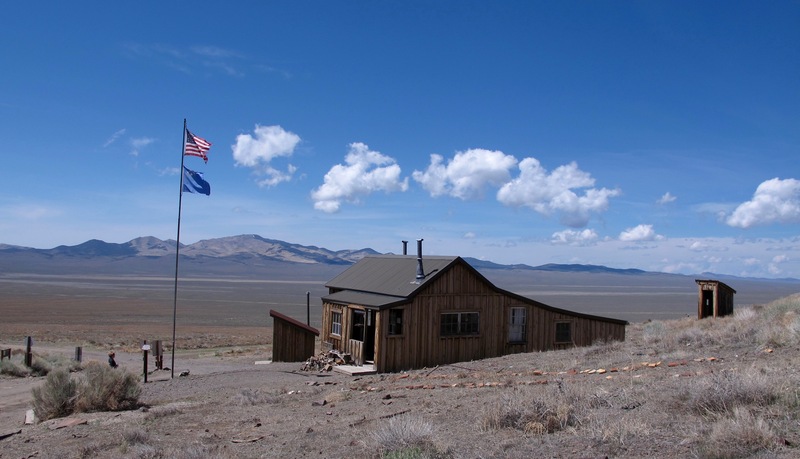 The visitor’s center with a 45 star flag flying over the Nevada state flag. The flag coincided almost exactly with the hey-day of Berlin, commencing in 1896 with Utah’s statehood and ending in 1908 with the addition of Oklahoma to the Union. It rained and snowed at the Berlin-Ichthyosaur State Park the day before we arrived, but as you can see from the pictures, we had perfect weather. It was such a gorgeous day (albeit a tad muddy in some areas) that it felt great to be outdoors to breathe perfect air, enjoy the sounds of outdoors, see and experience new sights, and enjoy being together as a family. That sounds like quite a trip. There’s so much to see and do near you. How fun! You always make things so interesting. I had NO idea that Minden was so close to Berlin! Well, you German Hoffmasters know your roots! Thanks for sharing! Another fun and interesting trip with your family! Thanks for sharing and for finding the beauty and value in every detail you find on your adventures. Thanks for sharing -loved it. I want to go there soon, before it gets too hot.